Chaos Legion is a 3D action adventure game that was released by Capcom for the PlayStation 2 and PC in 1997. You play the role of Sieg Wahrheit who is hunting down his former friend, Victor, who has stolen a forbidden book that will enable him to release the evil spirit Azrail who would do a bunch of really bad things. Typically you fight enemies in waves and must defeat all enemies in a given area before progressing to the next stage or level. Along the way you run across Arcia who is busy fighting for her life as the only surviving “Maiden of Silver” that was sent out to fight demons. She also happens to be hunting Victor for her own reasons. You two get to team up and have lots of fun slaughtering demons and eventually confronting Victor. The unique twist to this game is your ability to summon “Chaos Legions”. There are several different types with different powers and can be upgraded throughout the game. However, after a summoning you are left in a somewhat weakened state. On the surface, this game is somewhat like Devil May Cry. However, this was not one of Capcom’s better games. The PlayStation 2 version was mediocre at best and the PC version was quite a bit worse. There is little strategy involved and this is basically a button masher. The plot is relatively convoluted but yet it never really seems to advance much. It is also a relatively short game with little replayability. Not terrible necessarily but not worth the original price of admission. The PS2 version is definitely the one to look for. Fortunately, it is relatively modestly priced so picking up an original on eBay or elsewhere won’t be too hard. You can also choose emulation but there have been no official re-releases of this game as far as I know. 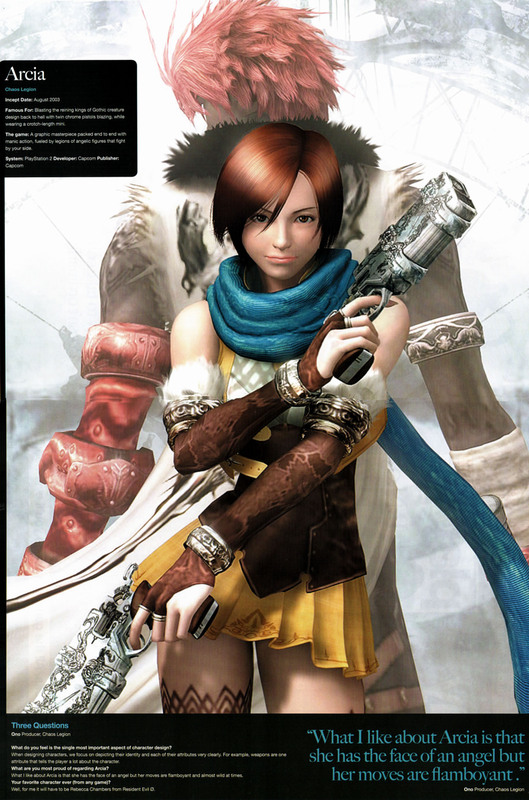 Pictured at the top is Arcia from Girls of Gaming and the screen shots are from the PS2 version of the game.